The 20th annual Mountain Mist 50 kilometer trail race was Saturday, January 25, at Monte Sano State Park. This is the premier trail ultra-marathon in the Southeast. It draws top runners from all over and sells out very quickly. This year's race was special for a few reasons. The field was expanded and there were 327 finishers, a record number. Dink Taylor, the race director and ultra running legend, actually got to run the race this year. It was his first time to run Mountain Mist. The course changed this year to spread the field out before the first technical descent. 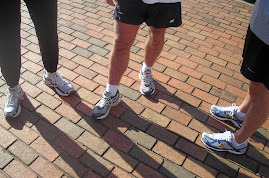 Three runners were toeing the start line for the 20th time, Dewayne Satterfield, Lonnie Vogan, and Jim Call. All three finished and received a special belt buckle for their perfect attendance at Mountain Mist. Because of the recent very cold weather, the course was frozen and very dry. The weather was cold at the start, but warmed to nearly ideal trail running temperatures during the morning. It seemed to be set up for some fast times, but it didn't end up that way. The winning time was over four hours for the first time since 2009. The overall winner was Scott Breeden from Bloomington, IN, in 4:03:52. The female winner was Sarah Maltby from Richmond Hill, GA, in 5:18:41. Overall results, age group results, and results with Fearn Road splits are available on the HTC website. There were six Limestone County finishers listed below.